My friend Kenn, a fellow Martha collector and aficionado of the Martha Stewart brand, gave me this collection of Martha Stewart Everyday postcards several years ago: duplicates from his personal collection. They were part of a promotional package for the 2002 Martha Stewart Everyday Holiday line at Kmart. I keep them safe in plastic sleeves in an album I have devoted to such Martha Stewart material. I thought it would fun to look back at some of these treasures. What strikes me, immediately, is how thoughtfully the collection is designed; the shapes and colours are beautiful, borrowing from vintage and antique styles in sophisticated, modern hues. These collections are no longer available. Winter Blossoms Venetian Glass Ornaments. The Winter Blossoms collection conjured up the romance of the Victorian Christmas. 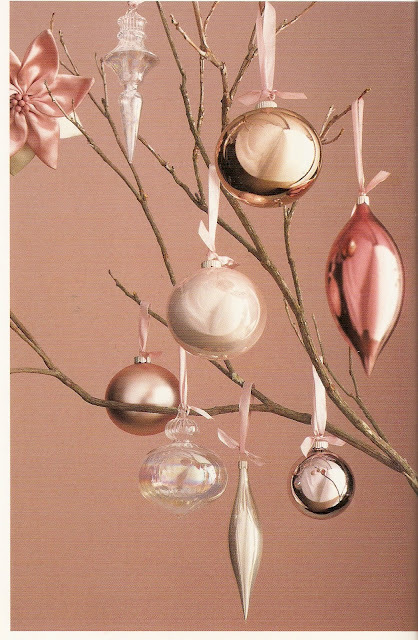 This assortment contained glass ball ornaments in beautiful holiday pastels and iridescent Venetian glass. There were also floral motifs evoking handmade silk ornaments in poinsettia shapes. Woodland Holiday Glass Ornaments and Ribbon Ornament Hangers. The Woodland Holiday collection calls to mind the beauty of a winter forest. Garlands featuring acorn designs, birds nest ornaments and wreaths decorated with nuts and pinecones were highlights from this charmingly woodsy collection. Classic Christmas Ornaments and Fancy Beaded Garland. The Classic Christmas collection was inspired by the traditions of Christmases past. 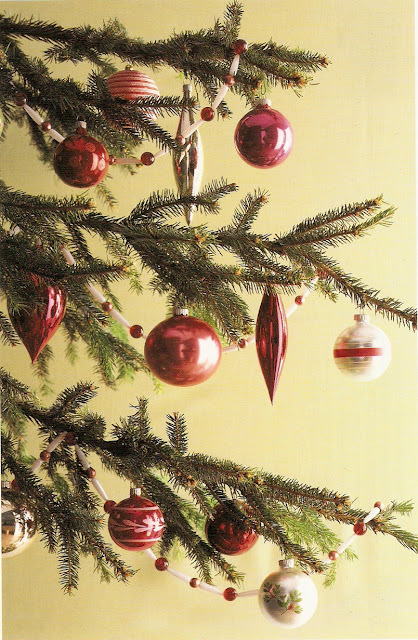 Ornaments came in nostalgic styles and patterns in this collection, rich with shades of traditional red and green. Golden Luster Glass Novelty Ornament, Beaded Garland and Sheer Ribbon Garland. The Golden Luster collection celebrated the richness and warmth of the holidays with a variety of glass ornaments in shades of gold. 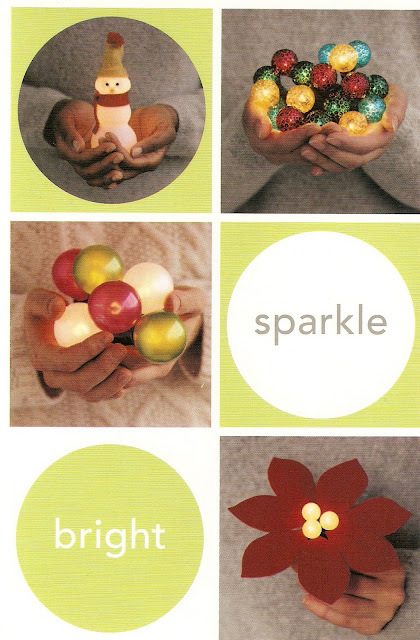 Apple, pear and grape-cluster ornaments were also availalble. First Snowfall Ornaments, Beaded Garland, Tree Skirt and Gift Wrap. The First Snowfall collection was all about the wonder of the newly fallen snow. Cozy knit stockings and snowflake ornaments captured the beauty of a snowy Christmas in a cool, crystalline palette of silver, blue and white. Christmas Favorites Ornaments and Beaded Garland. The Christmas Favorites collection was based on Martha's own beloved collectibles and some of her favorite holiday colors. Porcelain and glass teapot and teacup novelty ornaments conjured up a cozy feeling. 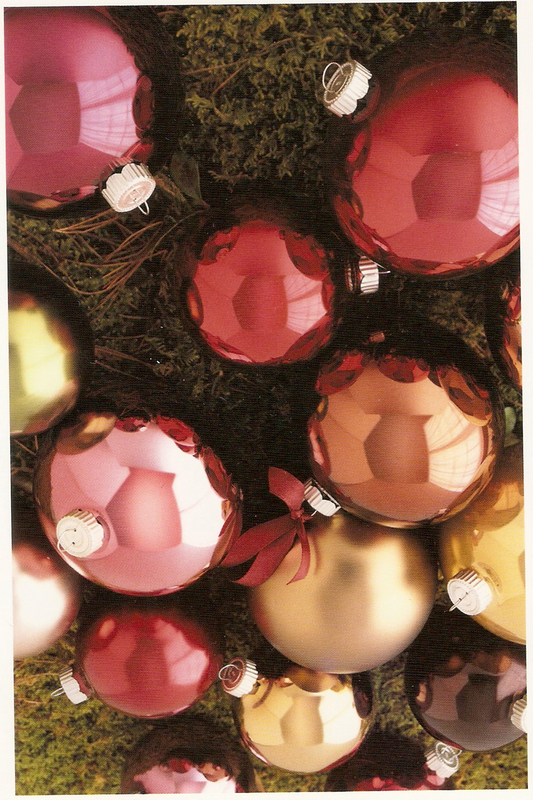 Unique glass ball ornaments came in distinctively "Martha" colors, such as her signature green. Gumdrops and Candy Canes Ornaments, Tree Skirt, Gift Wrap, Stockings and Flannel Sheets. The Gumdrops and Candy Canes collection definitely had the kids in mind. The fanciful assortment was dedicated to the whimsy and wonder of children this time of year. 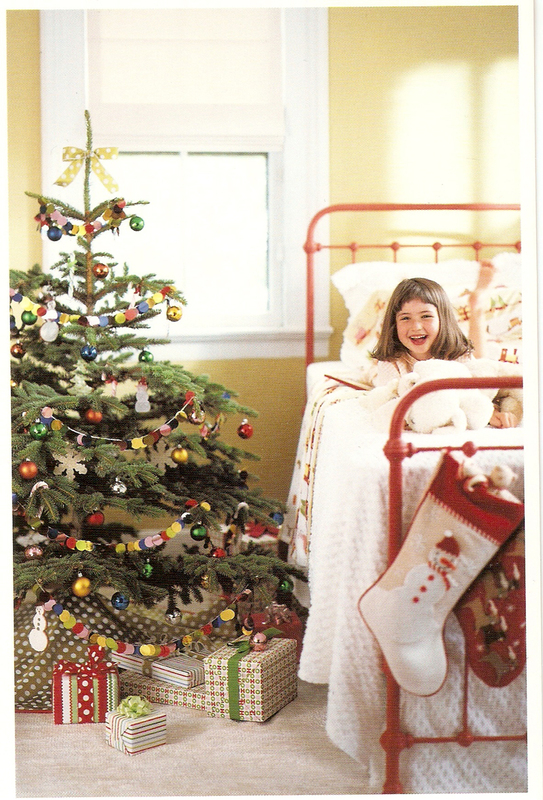 Decorated felt stockings and shatter-proof ornaments made this collection durable and festive. 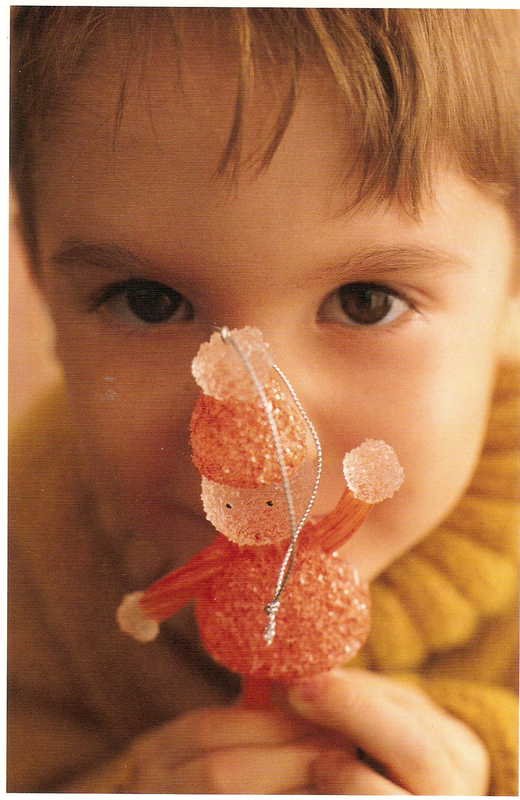 A close-up of one of the gumdrop ornaments. Many of the items in the Gumdrops and Candy Canes collection were translated from popular craft projects from the pages of Martha Stewart Living and Martha Stewart Kids magazines. 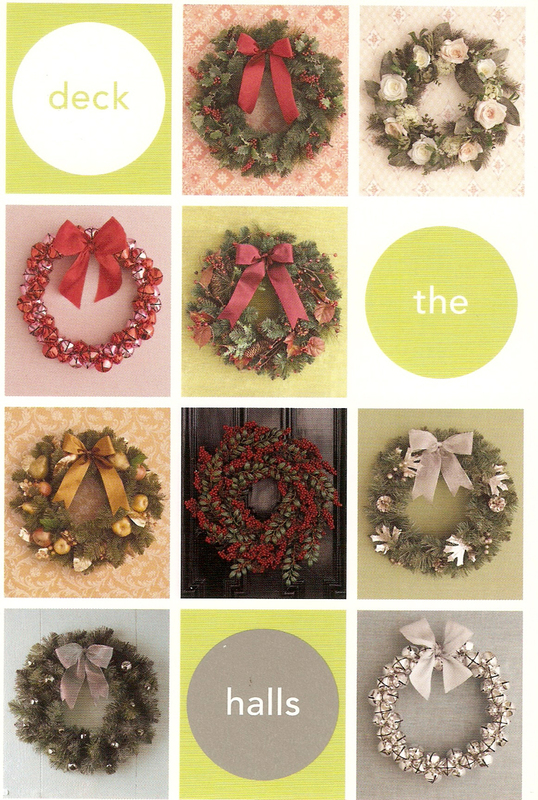 An assortment of wreaths from the various collections mentioned above. Some of the lighted holiday ornaments from the various collections, including snowmen lights, large pearl lights and poinsettia pearl lights. 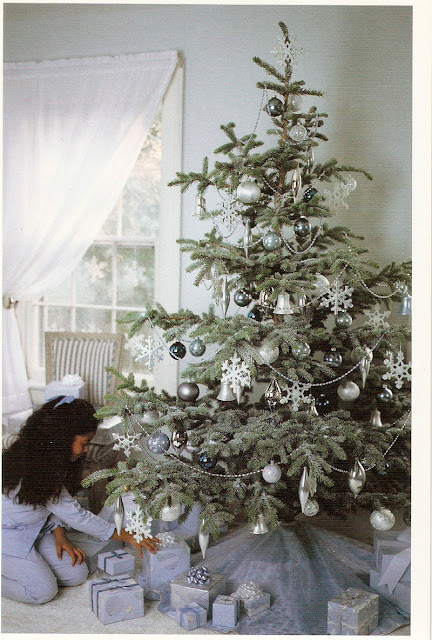 A tip from Martha: "On average, use 100 lights for each foot of tree. For a six-foot tree, you'll need about 600 lights. Use additional strands if you have a fuller tree or if you prefer lots of illumination." A gathering of some of the glass ball ornaments from the various collections, mentioned above. 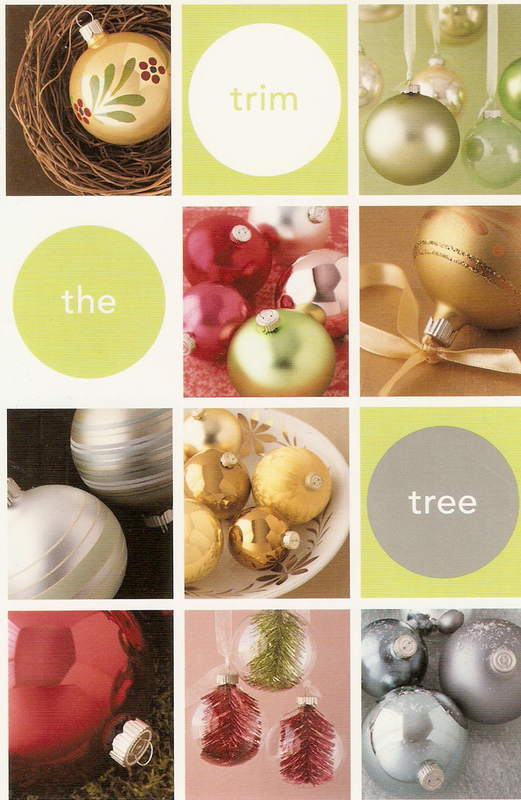 It's so funny that you posted about this collection.. every year, as I start to decorate for the holidays, I go through the card set. MSE-holiday was truly one of the best collections available and many, many of the ornaments are still treasured favorites each holiday. While going through the (many) totes of decorations this year, I found three boxes (never used) of the snowman lights.. truly treasures for my Martha museum! I'm so happy, that after all these years, you remember these cards so fondly. 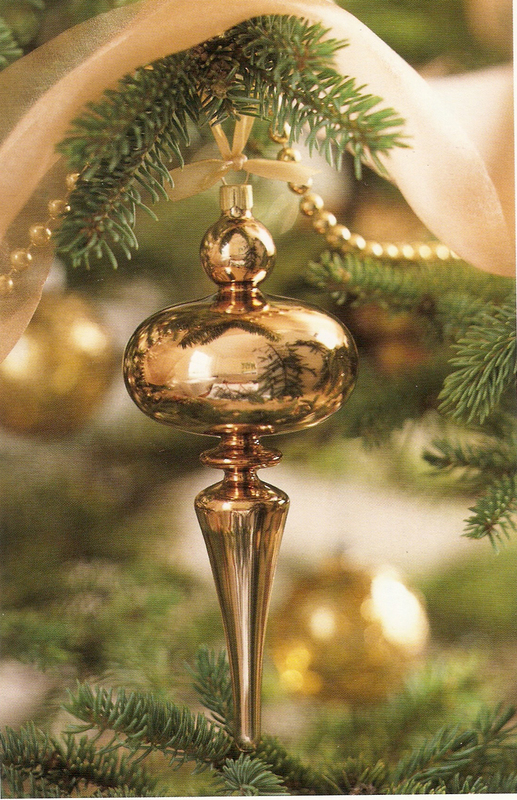 What I liked about the Everyday Christmas ornaments was the vintage looking toppers on the ornaments, they look like the vintage ornaments I have. Just one of the small details I miss on ornaments now. This post made me smile! Such pretty ornaments. What a happy post! The ornaments made me smile. I really miss these Kmart collections!! It really made me want to go to Kmart each Christmas to see what Martha had come up with for that year. The Macy's and Home Depot lines just aren't the same! Thanks for the trip down memory lane. Looking at my tree, most of the ornaments are MS Everyday, MS from Macy's or vintage. I miss going to KMart and seeing the different themed sections of ornaments from MSE. Woodland, First Snow, Modern, Candyland, etc. I liked that you could get small packs of ornaments, matching tree skirts, wrapping paper, etc in one theme or picks individual ornaments. I have yet to buy any of the holiday items from Home Depot. Buying a pack of 100 ornaments without much character isn't the same. MSE was very good about making the ornaments look vintage and thoughtful. Macy's MS Collection isn't quite the same but if you look hard enough you'll find touches of MSE. My favorite collection was the first snowfall. My white lights still burn brightly on my tree. I still have and treasure my Martha Stewart Everyday Ornaments from Kmart that I got years ago. Nothing at Macy's or Home Depot measures up in quality and design in my opinion. Thank you for this post! I am so thankful I had fair warning and was able to collect up as many of the Kmart ornaments as I could during the last season of it. They – even the shatterproof, plastic ones – are 1000x better than the quality of the cheap, generic Home Depot ones and the boring ones that Macy's carries. I am hoping eventually they find a way to bring back something similar because I cherish these ornaments so much! We still decorate three trees each year (first snowfall, sugarplum dreams and modern celebrations). The MSE collections at K-Mart were truly unique - and very tasteful at an affordable price. That is why we have three collections. When we found out Martha was leaving K-Mart we stocked up on paper, ribbons and bows. Thankfully we have enough for a couple of more years. Thank you for sharing these photos. 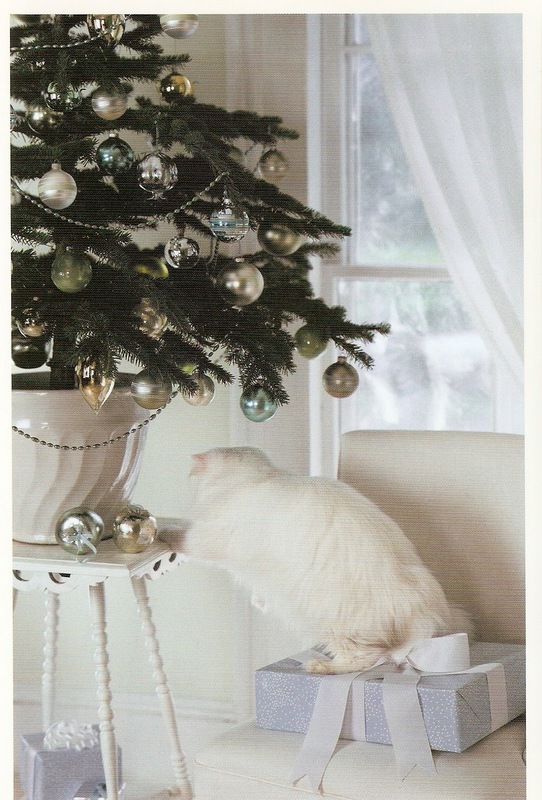 I purchased MS ornaments at Kmart for years. The chocolate brown and acid green ornaments are my most favorites. BTW, I believe Martha would approve of me using her glass glitter to embellish some of the plainer ornaments that I have collected through the years.